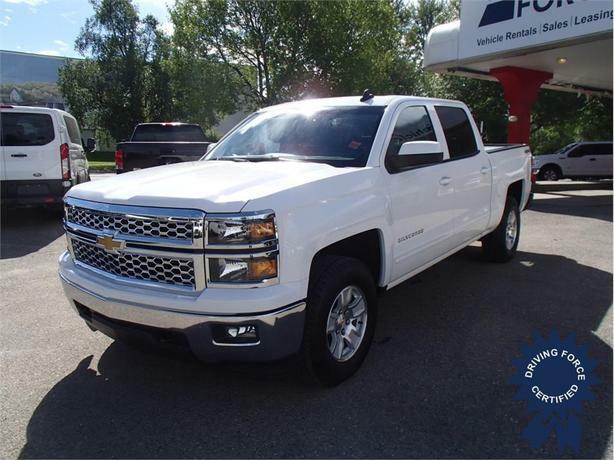 This 2015 Chevrolet Silverado 1500 LT Crew Cab 6 Passenger 4X4 Truck has a 143.5-inch wheelbase, 6-speed automatic electronically controlled transmission, 3.42 rear axle ratio, 17-inch wheels, cloth seat trim, Chevrolet MyLink Audio System and 8-inch Diagonal Color Touch with AM/FM/SiriusXM, USB ports, heavy-duty locking rear differential, integrated trailer brake controller, front halogen fog lamps, 10-way power adjustable driver seat, manual tilt and telescoping steering column, remote vehicle starter system, rear-window electric defogger, one 110V AC power outlet, rear vision camera with dynamic guidelines, EZ-Lift tailgate, 98-litre fuel tank, and GVWR rating of 7,200 lbs (3,266 kgs). The 5.3-litre EcoTec3 V8 with Active Fuel Management gas engine provides 355 horsepower at 5500 RPM and 383 lb-ft of torque at 4100 RPM. Touch base with us to discuss purchasing or financing options that are right for you and experience the difference you will only find at DRIVING FORCE Vehicle Rentals, Sales and Leasing.